Our website is a multi-level base of operations for our company and our clients. Inside you will find a wealth of highly functional interactive framesets that allow all concerned to navigate content regarding not only our various products and services but much more. For instance, you can reach and use a number of the most popular search engines all the while staying within the Andromedan framesets. Each destination is a single click away and you will find yourself using your browser's back button, URL address window and bookmarks far less often. You can even search Amazon.Com from the navigational comfort of this frame (link below) as well as a page dedicated to the Amazon.Com resource, complete with search engine, in our resource section Writer's Forum site. You are welcome to make us your home/start page. 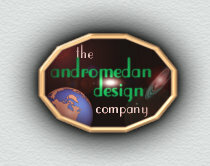 We think you'll find andromedan.com one of the web's most versatile and helpful starting points. This is the home of Googalies, an incredible new microfiber cleaning and polishing cloth developed by Andromedan as well a number of other creative and interesting products. Simply click our Products button at top to view them. We offer a wide range of services to our clients as well as a large array of resources. If you do not have the latest Internet Explorer or Netscape Navigator, please do yourself a favor and get them now by clicking on their respective links below . Their stand alone browser versions are free. Also, if you haven't experienced REALAudio yet we strongly suggest you do. It will open up an incredible world of entertainment for you and your family. Click on the link to go to the REALAudio download page. You will find links to some fun, unique sites (ours and others) in our services section under the REALAudio production link. This site is optimized for 800x600 but has been designed taking into account all possible resolutions and browsers - yes even WEBTV!